Between 1769 and 1823 Franciscan Missionaries that had come up from “New Spain” (Mexico) built a chain of 21 Missions all along the Californian coast from San Diego to San Francisco and Sonoma. The aim, of course, was to extend Spain’s empire to the North while converting and baptizing “los Indios”, California’s first inhabitants. Visitors to California today who travel the length of the state along highway 101 - more or less the same road that the Spanish fathers followed - cannot miss seeing the gracious green bell posts and their signs “El Camino Real” (the Royal Road) placed there to commemorate the founding of the Missions. 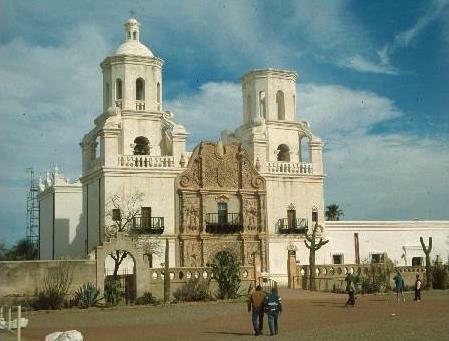 Mission san Jose del bac (AZ). Construction began on this church in 1783- considered today as the best existing example of Spanish baroque architecture in the USA. On this Thursday evening April 28th one of our members Virginia Coulon will show you slides of the Missions – most of which are parish churches today - and talk about the history of the Missions and about the role – nowadays seen as controversial - that their founder, “Padre” Junípero Serra (born on the island of Mallorca) played in the history of her home state California. Why not watching 1986's film Mission by Roland Joffré that depicts the experiences of a Jesuit missionary in 18th century South America. 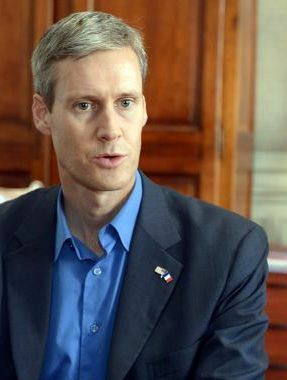 Our U.S. Consul in Bordeaux, Toby Wolf, will join us for un pot de l'amitié after Virginia's presentation on the missions. Doors open at 6:30, presentation is at 7:00 pm and the nibbles & wine are at 8:00 pm.